I bought a bread packet from the store and saw that there were almost some 15-20 ingredients in that while actually the bread would take only 5-6 ingredients. This only means so many preservatives/chemicals/artificial flavourings are added to increase the shelf life and in turn harm our self. So I decided to try making the bread at home and followed the recipe at Breadworld by halving the recipe since I wanted to make only one loaf. Making bread at home is unbelievably easy except you have to have patience to wait while the dough rises. 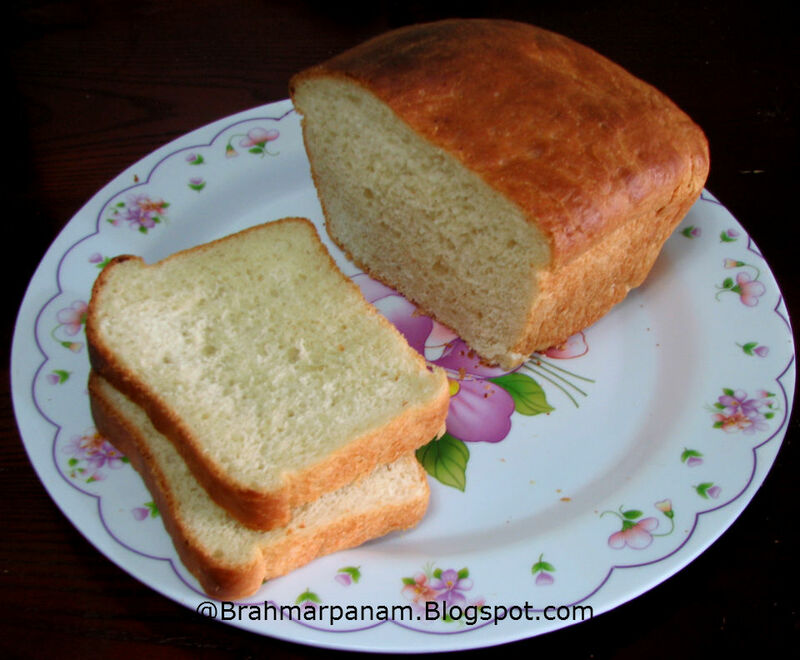 Nothing can beat the taste of freshly made bread and that too when it is homemade it becomes healthy as you know what you are eating. I have decided not to buy any more bread. So be ready for more bread recipes!! 1) Add the Sugar and Yeast into the Warm water and keep aside for 5 min till it foams up. 2) In the meantime, add 2 cups of Flour and Salt and mix. 3) Warm the Milk and add the Butter and add them to the flour. Add the yeast solution too and knead the flour well. Add the remaining flour little by little while kneading. Knead well for 8-10 min. 4) Grease a big bowl with a little butter and place the kneaded dough ball in that and flip it over once so that it is slightly greased on top too. Cover it lightly and allow the dough to rise in a warm place for 1 hr. 5) When the dough has almost doubled in size, punch it down and shape it into a rectangle. 6) Grease a loaf pan (8 1/2" x 4 1/2") and place the dough in it and pat it slightly so that it takes the shape of the loaf pan. 7) Cover it loosely and place it again in a warm place allowing it to rise once again for around 30-45 min. It will look as below once risen. 8) Bake at 400F for around 25-30 min or till done. 9) Remove from pans and cool on wire rack. 10) Once completely cooled, slice the bread with a knife and serve with Butter!